Halloween is the one time of the year to get creative and dress up in a unique one of a kind costume. I spend a lot of time to think of what to dress as. Each year I try to go out a few times so that I can dress up in various different ways. 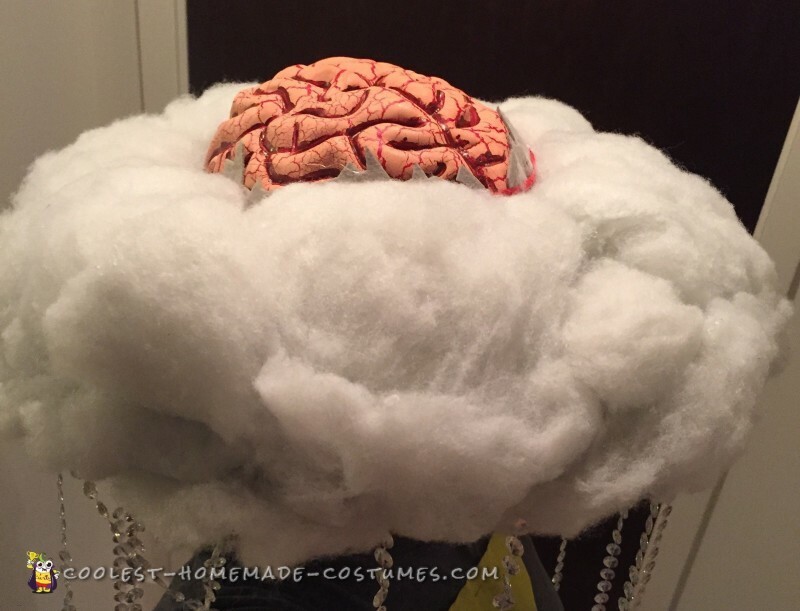 I spent some time brainstorming costumes and decided on an actual “brainstorm” (a pun/play on words). I have seen people do the puns before – cereal killer, gold digger, deer in headlights, etc. – and have not seen the brainstorm done before. I decided to do this one week before Halloween so my time was a little limited. I had to figure out exactly how I was going to do this. The first step was to search for people who had done rain/clouds/storm type of costumes. I did not want to carry an umbrella around so I chose to do a hat instead as the cloud. Then, I went shopping to find the items used for this costume. Bloody Brain Cap (does not look this bloody in person). Yellow Fabric (Any craft store). Cotton Filling (Any craft store); I used an old pillow. Any Gray Shirt / Clothes you have. Cut the beads into long strands to the length of your liking. Mine were about 18 inches. Using a stapler, attach the beads to the hat. 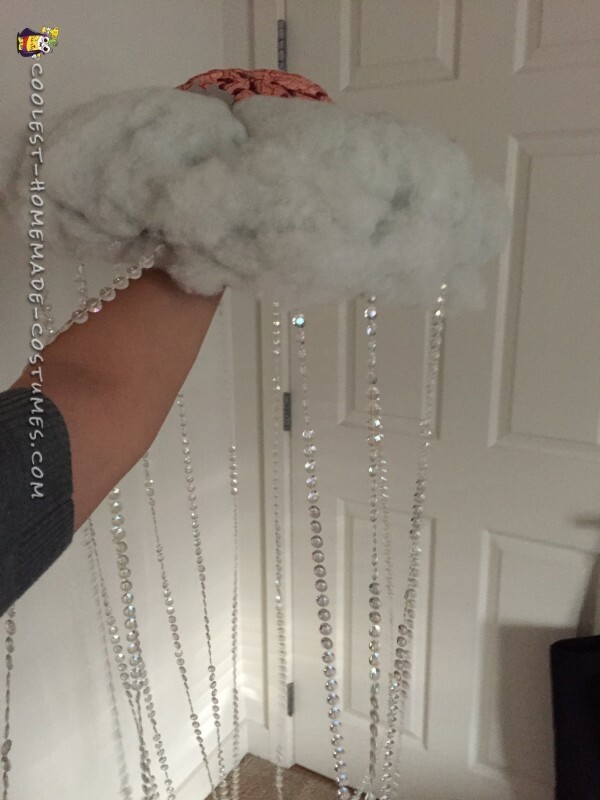 Glue the cotton stuffing onto the hat to make a cloud. Leave the top center open to glue the brain. Cut off the “bandage” part from the bloody brain. Glue the brain onto the top center of the hat. Print out a lightning bolt template online or free hand outline it on the fabric. Safety Pin the lightning bolt to your shirt. If you find a different brain, this can be attached more towards the front of the hat. Instead of beads, pin cut out rain drops on the shirt. I got many compliments from friends and people on my costume! They thought it as creative and clever. I am wearing a big clouds with beads as rain coming down, so people were in awe that I made my costumes so well.